The UK has emerged from the dark days of the global downturn. According to the Organisation for Economic Co-operation and Development, growth in the UK has picked up rising to 2.6% in 2014, the strongest improvement of all G7 countries. Innovation is at the core of this recovery and is central to our future growth. It enables our competitiveness and helps capture the new customers and markets that secure our income. That is why this government made a clear commitment in its election manifesto to make Britain the best place in Europe to innovate and patent new ideas. The Intellectual Property Office (IPO) has a major part to play in delivering this promise. 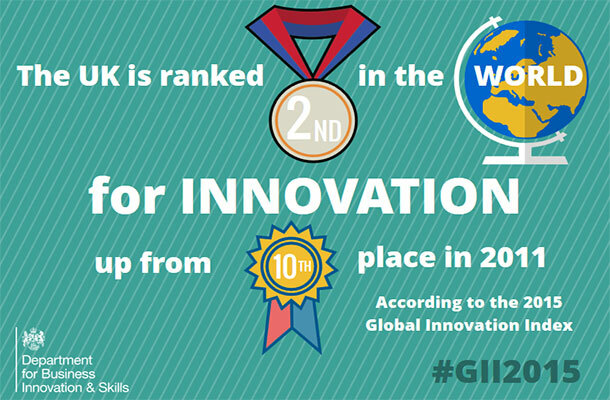 The UK has the best ranked IP regime in the world and I am proud that the UK has retained its 2nd place ranking in the Global Innovation Index. A large part of this success is due to the work of the IPO. We have re-shaped the legislative environment to fit the needs of today’s businesses with the passing of the Intellectual Property Act and important secondary legislation. Today we launched our Innovation and Growth Report which illustrates the importance a thriving IP environment can have on economic prosperity. We have kept pace with rising demand for rights granting services. This year for patents, there were 17% more requests for applications to be searched than 4 years ago. Similarly, demand for designs registered in the UK has increased 24% over this period. Recognising the value of brand protection, trade mark applications have also boomed with 61% more applications filed in the past financial year than there was 4 years ago. We have improved the way the IPO delivers services. We have expanded the range of IP self-help tools and guidance for business. We invested to make sure that more business advisors can offer wise counsel on how the value of good ideas can be maximised. During 2014/15, our customer satisfaction was 85% and our stakeholder satisfaction 90%. This shows that we are delivering a high quality service that meets the requirements of our customers. We have made sure that UK businesses have the confidence to tap into global market opportunities with the appointment of specialist IP attachés in key markets. This helps protect around £400 million of IP assets owned by UK businesses operating overseas. We have made the UK a leading voice in developing a stronger and more understandable global IP environment. We have supported the UK’s trading ambitions by chairing international forums and attending symposiums in China, India, Brazil and Singapore. We have also established the Unified Patents Court in Aldgate Tower in the heart of London. As we shape the IP environment, we have also taken action to address the challenge of IP enforcement. Although the IPO is not an enforcement authority, we are playing a vital role. We have worked to build consensus of the importance of effective enforcement mechanisms. A significant milestone was our decision to support the activity of the Police IP Crime Unit (PIPCU) for a further 2 years to 2017. We both want to create an environment in which IP is respected and in which infringement is challenged. We are also at the forefront of work in the EU on the digital single market. Digital change is affecting almost everything and we are working to reduce digital piracy. We have asked search engine providers to reduce the prominence of copyright infringing websites and squeeze their income. In the past year alone, PIPCU removed 4,650 IP offending sites with a ‘.co.uk’ address from the UK domain. I am proud to lead this government’s IP story. Providing the best environment for our innovators and creative talents is essential to our economic future. But there is further to go. I believe that the IPO has the insight, skill and commitment to meet the forthcoming challenges. The services that the IPO offer have significantly grown over the last 20 years. It is to the IPO's credit that the diversity of services is such that you can easily register a trade mark using the IPO website or alternatively resolve a patent dispute using the dispute resolution/ mediation service. I am an intellectual property solicitor and I have been consistently impressed with the nature of the development of the intellectual property services offered by the IPO. Well done and keep it up!